A while back, when I was around five or six… I had a dream. It was like any other dream I suppose, except that in the end, I murdered one of my siblings. I haven’t seen any data to suggest that such dreams are normal, but I haven’t actively sought out that data either. After all, what’s in a dream? A thought at any other time might smell as sweet. As I mentioned before, I was quite young and this dream scared me, but who could I tell? I didn’t want the one I murdered to fear me. 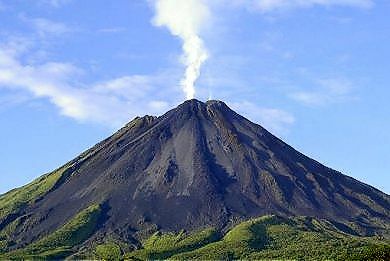 For that matter I didn’t want my parents or siblings to fear that I would push them into a volcano too. Let me just mention that not all of my early fears were rational. Did I mention that I used to be afraid of the moon? So, after mulling over the dilemma for most of the day, I decided to sleep on it. I regretted it in the middle of the night when I pushed my brother into a volcano again. I really don’t know how Cain dealt with the guilt of murdering his brother, but It kept me up for a good portion of the night, and I had to forgive my older brother for whatever it is that he had done to me a few days ago as soon as we were both conscious. Only in hindsight did I learn these two lessons. Don’t go hiking on the rim of a volcano with a brother you are mad at. Those are in no particular order. This entry was posted in Uncategorized on January 17, 2014 by Matthew Gedeon. I realized the other day that for my generation, the supreme virtue is being interesting. Being right is optional. Being clear is optional, but if you aren’t interesting, you’ll never cut through the noise. This entry was posted in Uncategorized on November 18, 2013 by Matthew Gedeon. This entry was posted in Uncategorized on July 28, 2013 by Matthew Gedeon. This entry was posted in Uncategorized on May 9, 2013 by Matthew Gedeon. Marshmallows are pretty, but they aren’t food. This entry was posted in Uncategorized on April 1, 2013 by Matthew Gedeon. I’m being purposefully vague. I’ll clarify later, but for now, lets just say that I want to have a record of my feelings on this matter. Just like when I was told to move to RI, I don’t have more than my next step, but enough to get me going on the right path. Of all the decisions I’m likely to make, this isn’t one of them. Mostly, I’m petrified and completely sure that I’m not up to the task, which means that I must be absolutely sure of my calling, because God will always equip the ones He calls, but the pretentious have no such guarantee. This entry was posted in Uncategorized on March 26, 2013 by Matthew Gedeon. I’m a real music lover….which is why I’m so happy when a sad song gets an upgrade. This entry was posted in Uncategorized on February 26, 2013 by Matthew Gedeon.